Southampton: England picked up an unassailable 3-1 lead in the five-match Test series as India slumped to a 60-run defeat in the fourth Test at the Ageas Bowl in Southampton on Sunday. After keeping the series alive with a resounding win at Trent Bridge, the visitors came close to edging their counterparts but were let down by another shoddy batting display. With Virat Kohli and co coming under-fire after another away Test series loss, Sourav Ganguly has raised questions over the teams batting ability. "This batting lineup hasn't been making runs for a long time now. If you look at India's overseas performances from 2011 until now, they have lost every big series. When Virat Kohli is at the crease it seems that he is playing against totally different bowlers as compared to when the other batsmen are batting. I believe that the batting ability of the current players has gone down. There are a lot of reasons for this. Firstly, the players are short of confidence, whether you look at (Cheteshwar) Pujara or (Ajinkya) Rahane, you'll find that four years ago, the latter was matching Kohli shot-by-shot in Adelaide which is not the case at the moment. The same goes for Pujara too," the former India captain was quoted as saying by Aaj Tak. Dada opined that members of the team management including head coach Ravi Shastri and batting coach Sanjay Bangar should be answerable for issues that have been troubling the team. 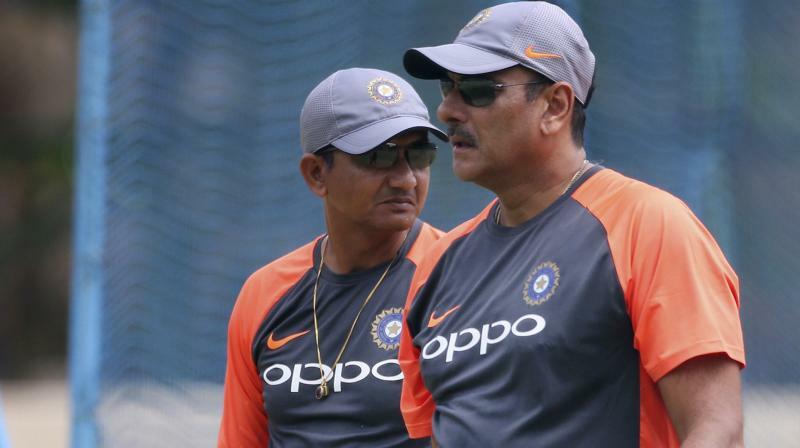 "Regarding Ravi Shastri, he has to be held accountable for the results along with Sanjay Bangar regarding why only one batsman is performing whereas others seem to have taken backward steps. Unless these questions are answered an overseas series win in the three countries looks impossible for India," he added. Ganguly also hinted that other members of the team needed to step up despite Kohli’s contributions. "I can understand why Virat Kohli is saying what he is saying in the press conference because you still have to sound positive in such situations. But in the last 7 away Tests, India has lost five. Agreed that the Southampton Test was a close contest, but after Kohli got out the commentators started saying that India will lose the match. That is what happened and has been happening for quite some time now, match after match, innings after innings. Just taking 20 wickets won't win you matches, you have to score runs as well," he signed off. We all know that Shastri isn't going anywhere. Post 2014 test series, Fletcher's support staff was fired. Why not this time irrespective of the final result as we've already lost 2 of our overseas tours. I'm not defending our batsmen but Bangar needs to go. Look at Cook's tribute to his batting coach Graham Gooch & how he massively helped him in his career. Everyone in the English batting line up was scoring heavily during his time & that too some massive double hundreds. While some here think it's all mental, our batsmen need someone who can address their technical issues & knows how to grind it out in tough conditions. May be bharat arun guy is good as siraj and other anecdotes say. But Shastri and Bhangar are certainly under scanner now. Cheerleading must stop. Time for evasive action. Dravid will never consider coaching Team India as long as Kohli is around as captain. Need to find some other scapegoat who is accountable somewhat. Graham Gooch's philosophy in coaching is to make suggestions but it is the players decision whether to work on his suggestions . He says they are professional cricket players and each player must take responsibility for their own game . They must work out how to improve and work on it. He spoke about Cook working very hard on off side shots as he was a natural leg side player, he also cited Kohli who looked at how he needed to improve in England and get the best out of himself. He absolutely correct because if the Indian batting coach is at fault for performances of Rahul etc then he must be praised for getting Kohli better? Shastri can drink with the best and he speaks good english. I don't see any problems. There is a darned good reason why dada was and is always going to be my favorite cricketer. He speaks his mind like a boss and does not hold back. Compare that with Gavaskar who shamelessly paddled Shastri for India dada on the other hand is pointing at the root cause of the problem. Not a word dada said is wrong. Thank god we have people of integrity like Dada the boss. Kohli is an extremely hardworking athlete & is quite clear in his head with his approach on batting. Kohli would've been successful even if Sunil Joshi was our batting coach. Scoring at home for our batsmen was never a problem, the issue was consistently scoring abroad & barring Kohli nobody has stepped up. Can't say about what kind of hardwork is put up by our boys or inputs given by Bangar but as a batting unit we have failed. All we've seen is lip service & tough questions to be dodged. You miss the point here. Graham Gooch was one of my favorite player but boy he is clueless about coaching. It is the job of the batting or bowling coach to spend countless hours in film room going over every play and ponting out the mistakes the batsman has made. Send him to the practise field again for countless hours to work on his issues. Take films again and repeat and rinse till he gets it. If he refuses then he is out. Not too difficult a concept. Coaching is very important. Graham Gooch also learned his batting stance from watching lot of baseball. And trust me baseball is at a different level than cricket and they know how to coach and train. Rahul needs lot of help and kohli does not. That is part of coaching. Also Kohli can be coached up too. Do you think a junior player who is looking to make his debut, will say anything bad about any of the current Indian coaches? or the Indian captain? Actually you miss the point which is yes a coach is important and all those things you speak about but it's a player who must have that will inside to improve , only he bats out in the middle . As a Graham Gooch's fan you will remember why he adopted that stance and as it wasn't being adopted by everyone it must have been something he changed personally to improve his game and therefore take person responsibility for his game, his career . Personal responsibility is important but a coach has to lay down some guideline along with a timeline. It is the job of the coach to see if improvements are being made and then kick out those players who are not progressing. It is 24/7/365 job which moron Shastri will never get it.